Nobel Prize-winning economist Joseph Stiglitz poses for a portrait at the Liu Institute for Global Studies on campus where he's teaching a seminar on economic inequality this term. 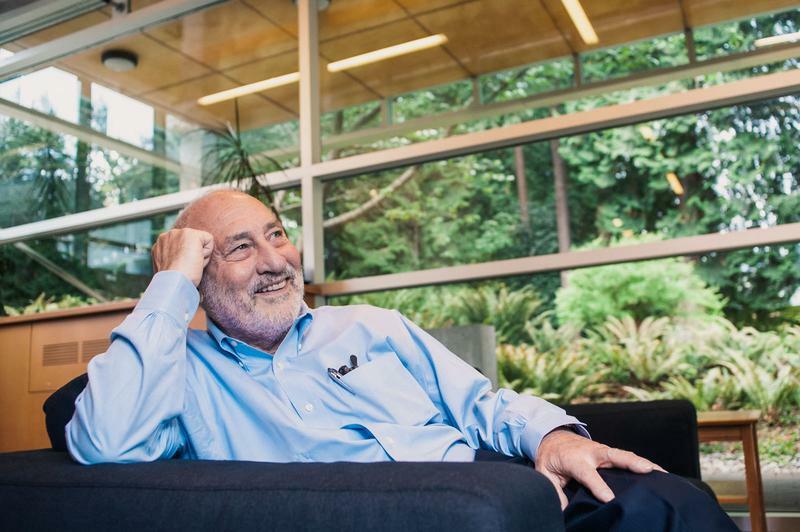 Before the interview starts, Joseph Stiglitz wants to know how often The Ubyssey comes out. He sees the video equipment being set up and wants to know what the... what’s the word, viewership of our videos is. The Nobel Prize-winning economist is known for having a big ego, but his interest in this newspaper’s audience may have more to do with what has become a sort of mission for him over the last several years — getting out his message on the perils of economic inequality. He’s written over 10 books including textbooks that are used in universities around the world. He also frequently speaks at conferences, publishes op-eds responding to current issues like climate change and American political events, and appears on shows like Real Talk with Bill Maher and The Daily Show with John Stewart. Stiglitz is here to teach a Friday seminar this term as part of the Liu Institute for Global Studies’ Lind Initiative which is bringing a series academic celebrities to campus. Stiglitz, a professor at Columbia University in New York City, will be teaching about inequality including much of his own work. Inequality, Stiglitz argues, is nothing short of a crisis imperiling our societies and driving down our economies. But the man is not a doomsday prophet and sees hope. Inequality has risen to the fore of the political debate, especially in the United States, with first the Occupy protests and now with the rise of progressive politicians like Elizabeth Warren and Bernie Sanders. Now it’s inequality itself that is seen by many as poisonous. As the dogma of supply-side economics promoted by Ronald Reagan and Margaret Thatcher fade from prominence, there is more room for Stiglitz to win people over. He sees the university as a prime place to promote his message. That formulation can have a tremendous impact on the worldview of graduates. To counteract this, Stiglitz studied economics at Cambridge, MIT and the University of Chicago— three programs known for spanning the political spectrum from left to right. In the end, Stiglitz fell somewhere between the dirty reds of the old Soviet Union and the capitalist swine of the United States who prey on the soft innards of the proletariat. The ideas in Rand’s books, like Atlas Shrugged and The Fountainhead, are ones of individual power and the ability of a single man (and it almost always is a man) to shape his destiny. The tales are classic rags-to-riches stories that lead to policies of deregulation and lowering taxes on the rich which Stiglitz calls “plausible” but lacking intellectual depth. As for his own ideas, Stiglitz believes in equal opportunity and doesn’t entirely write off the American Dream’s potential. But he says the current economic system — the set of regulations, taxation, monetary and financial policies — quash that potential. “I tell my students there’s one important decision that you have to make in your life and that is choosing the right parents,” he said, pointing to the opportunities missed by people based on the conditions in which they grow up. To help equalize this imbalance, he wants to see higher education available to everyone. While that may require a more comprehensive reform of the educational system, a minimum tuition should not stand in the way. Stiglitz is also in the unique position having worked within and against the system advising presidents Bill Clinton and Barack Obama and working for the World Bank. However, he also has stridently attacked White House and international economic policies. Still, Stiglitz acknowledges the system is broken. Over the summer, he protested outside a meeting room where international monetary policy leaders were deciding on interest rate policy — a room he’d been a regular in in years previous. Despite his criticism of the free market, Stiglitz is adamant about one thing. After examining a Ubyssey editor's new plastic five-dollar bill, the world-renowned economist lamented that counterfeiting — a perfect example of what Stiglitz calls society’s increasingly anti-social behaviour — has necessitated the shift from paper money. But might counterfeiting be a solution to economic inequality and a way to level the playing field?